On our Tuesday trip today we go to Ogulin, a city of Croatia that is located at the foot of Mount Klek and stands out for its typical mountain beauty. Here we are going to visit a modern country house that was designed in the year 2016 by the architect Tomislav Soldo. It has an area of 100 square meters and consists of a small cellar on the basement floor, a living room with open kitchen and bathroom on the ground floor and a space for the bedroom on the mezzanine. Do you want to know it in more detail? We’ll tell you everything below … It has a lot of charm! Before this house was built in this place there was a walnut, which provided a perfect natural shade. Over time, a terrace gradually formed around the tree and then came the idea of building the house. 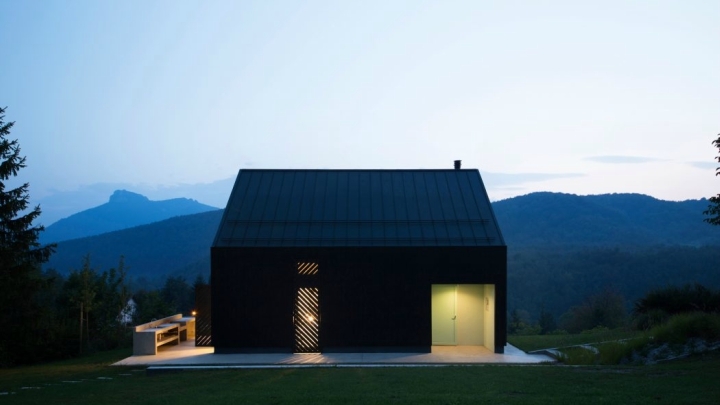 The sloping terrain with its panoramic view towards the forest and towards the mountainous landscape with the existing terrace were the only determining elements in the process of designing this country house. The sloping roof, the compact design and the use of the wood in the facade cladding became the distinctive components of the region that were accepted and that ended up being put into practice in this design. The result, a cozy and different home with personality. With this house has sought to achieve an integration between the interior and exterior. For this, among other things, has designed an outdoor kitchen and has sought an interior design in which open spaces were the protagonists. All this connected always with the outside area. In this way, the whole house is perceived as a unique volume in which nature is reflected in every corner. 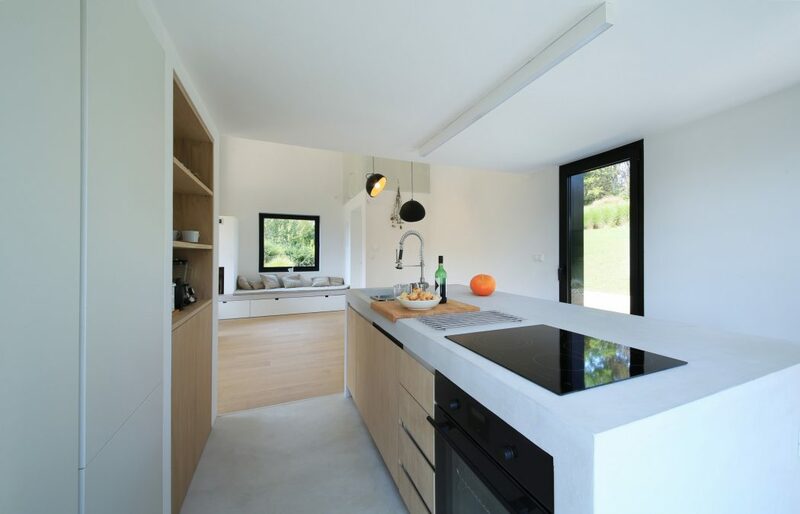 The kitchen and bathroom form a small compact set within the larger overall volume of the whole house. Apart from the concrete basement and foundations, the house is constructed entirely of concrete blocks. The outer walls are 30 centimeters thick. Energy efficiency was enhanced by a ventilated Siberian larch cladding facade, which prevents excessive overheating during the summer and heat loss in winter. 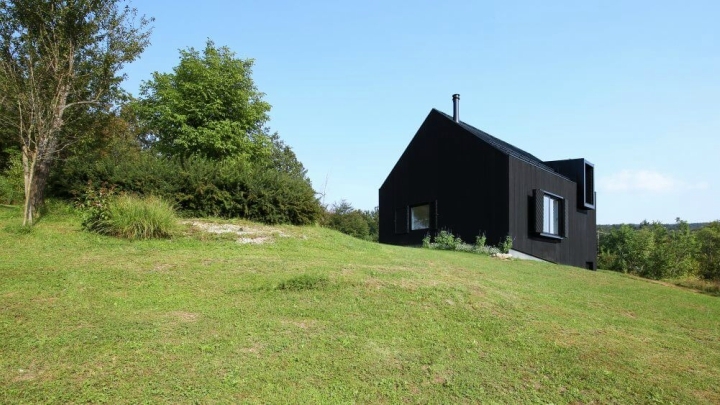 The facade is painted with two layers of black tar, a natural product that penetrates deeply into the wood and protects it. In addition, it is a very durable material. The appearance of the compact black structure during the day, with an almost monolithic appearance, is disturbed at night when lights are turned on. The house becomes a kind of lantern when the sun goes down, as it projects light into its surroundings through the slots and manages to imitate the rays of the sun that illuminate the interior during the day.